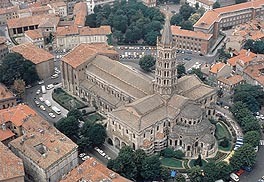 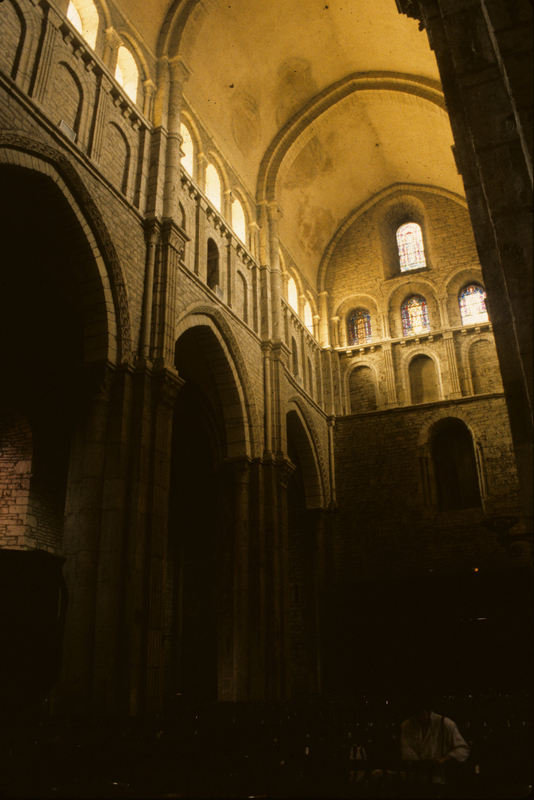 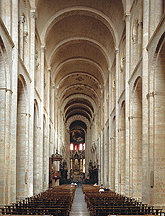 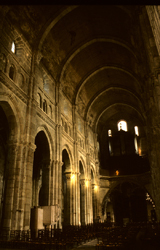 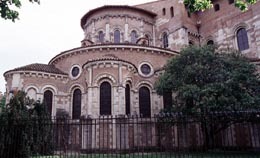 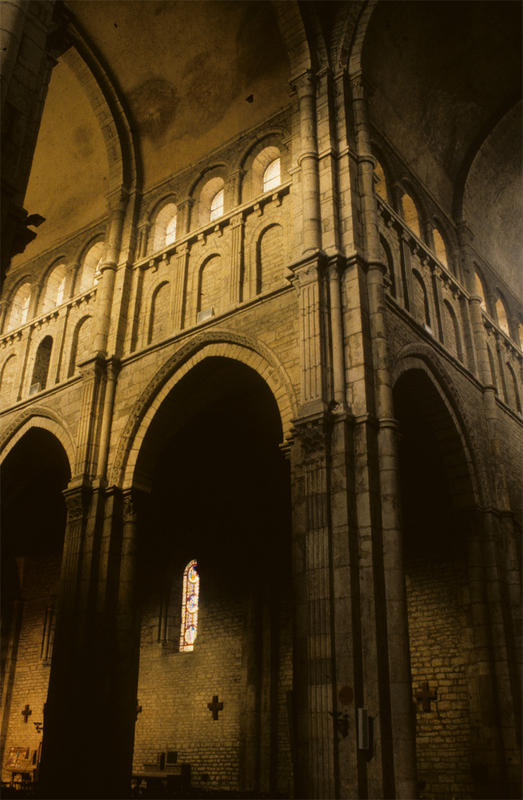 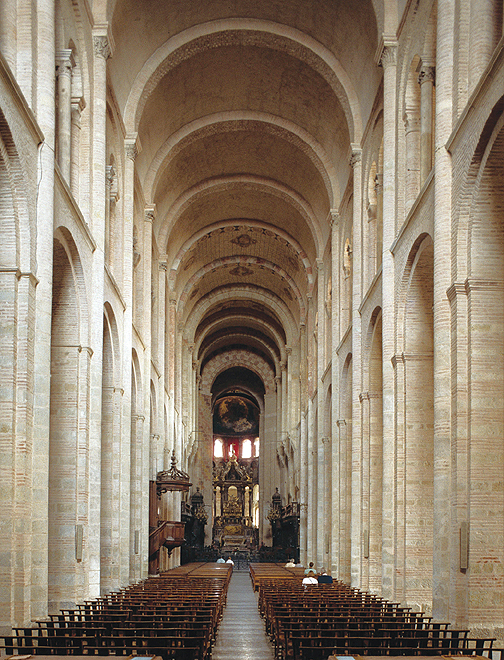 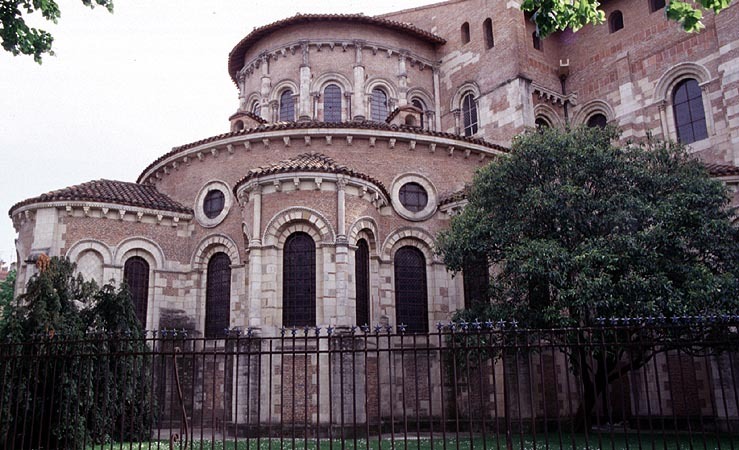 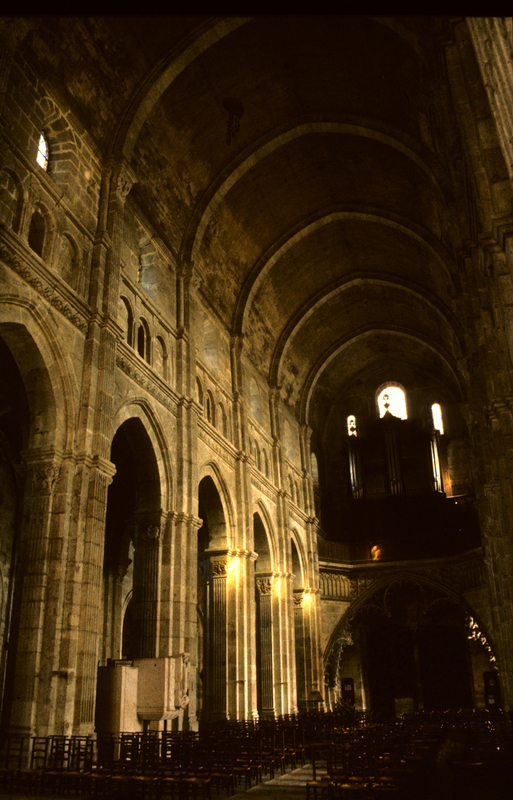 St. Sernin at Toulouse: construction began about 1060 and the nave was vaulted about 1119. 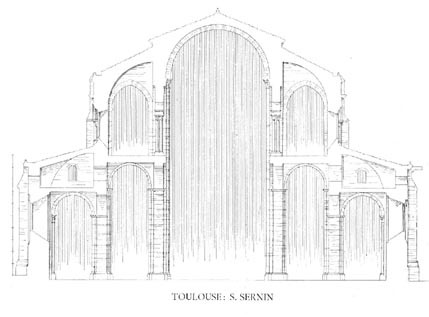 East end of St.Sernin showing Choir, ambulatory, and radiating chapels. 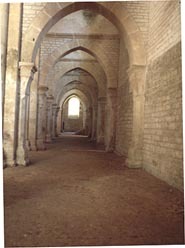 Nave with barrel or tunnel vault. 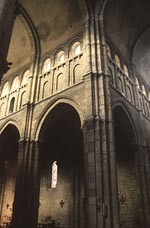 Nave elevation formed of nave arcade with gallery above. 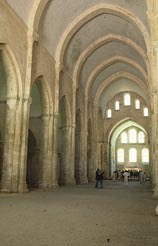 Barrel Vault with transverse arches connected to attached half columns that extend down to compound piers. 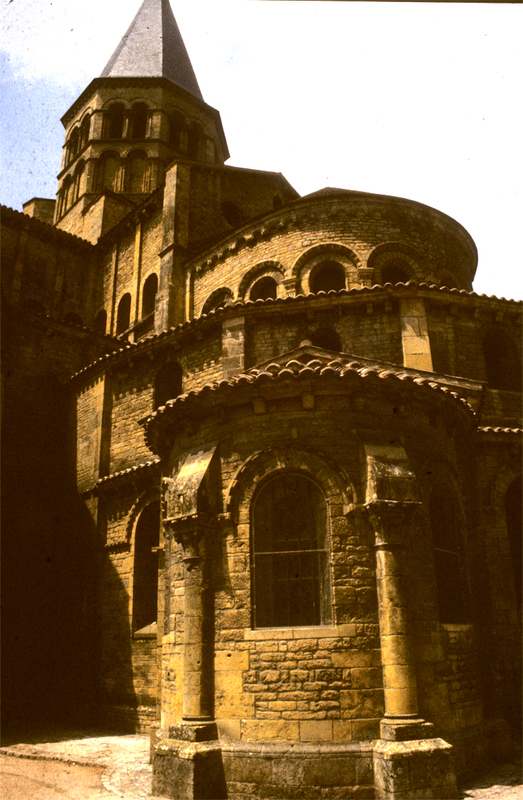 St. Foi at Conques: mostly built between 1100 and 1130. 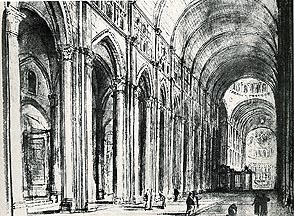 Cross Section showing gallery. 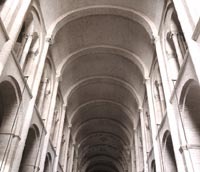 The thrust of the nave vault is transmitted down the half barrel vaults in the gallery. 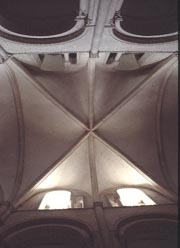 Diaphragm arches reinforce half barrel vaults. 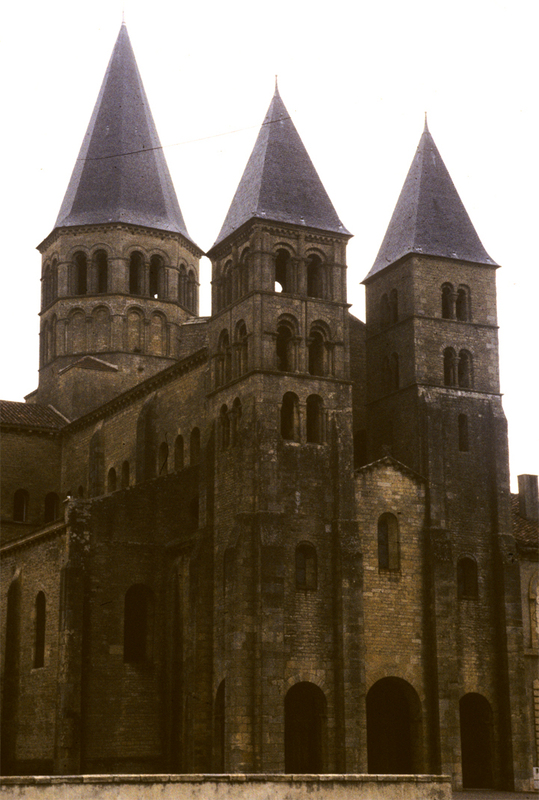 Wall buttresses on the exterior contain thrust. 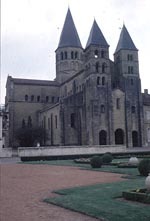 Cluny III: Abbot Hugh (1049-1109) began the rebuilding of the Abbey Church at Cluny in 1088. 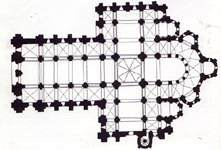 Construction continued for the next forty-two years. 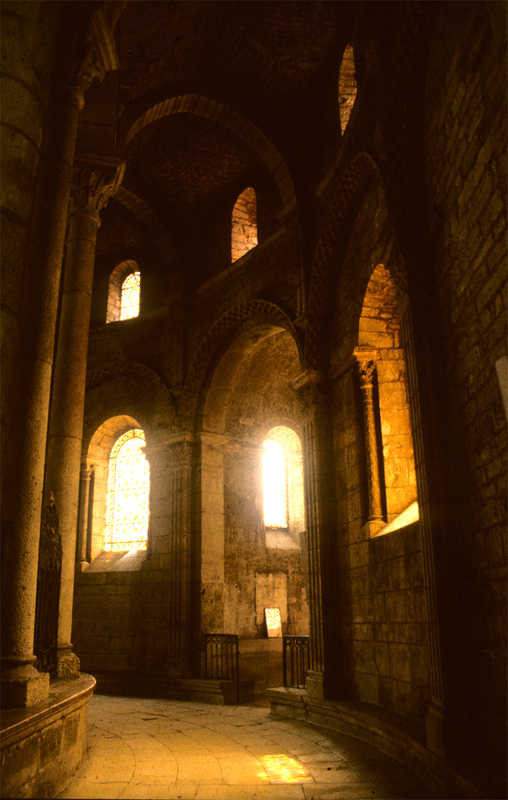 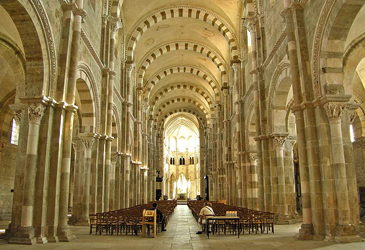 The five aisled nave was completed in 1121 under Abbot Pons (1109-22). 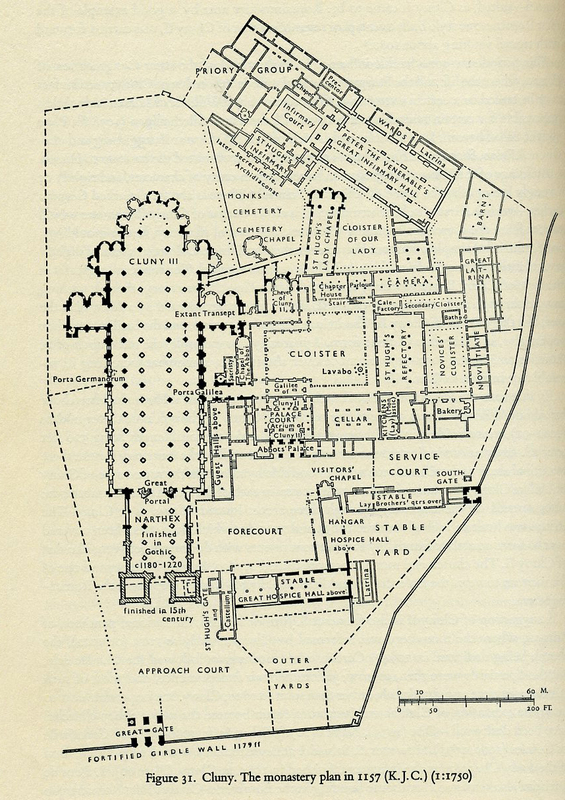 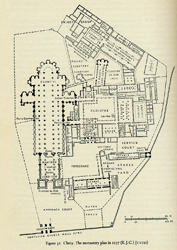 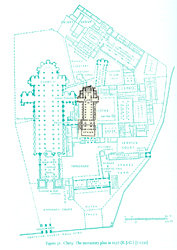 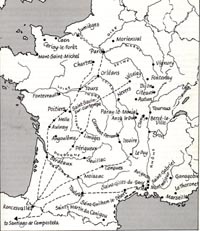 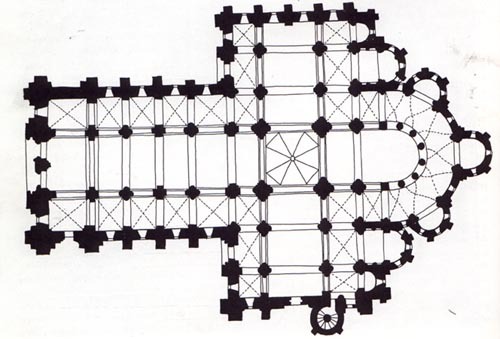 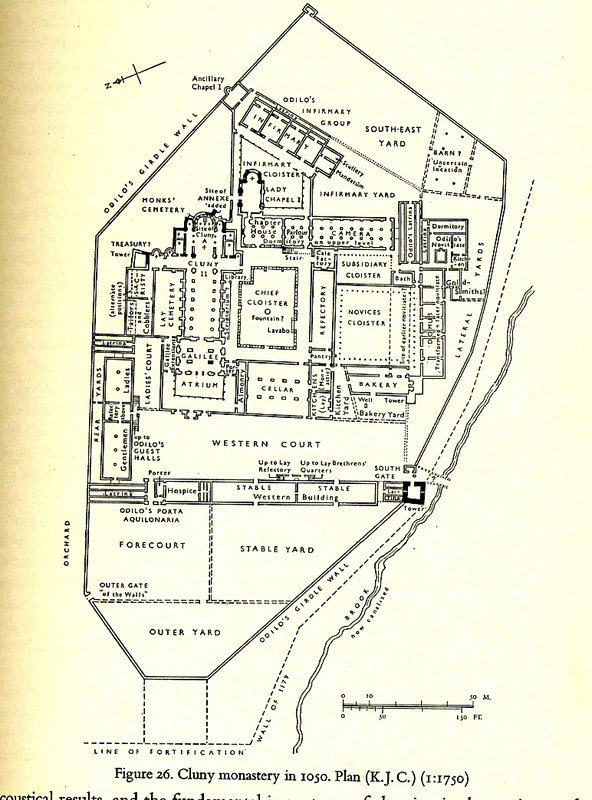 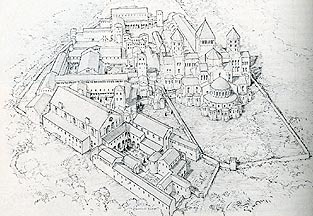 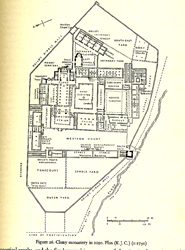 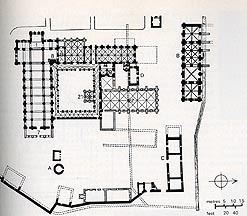 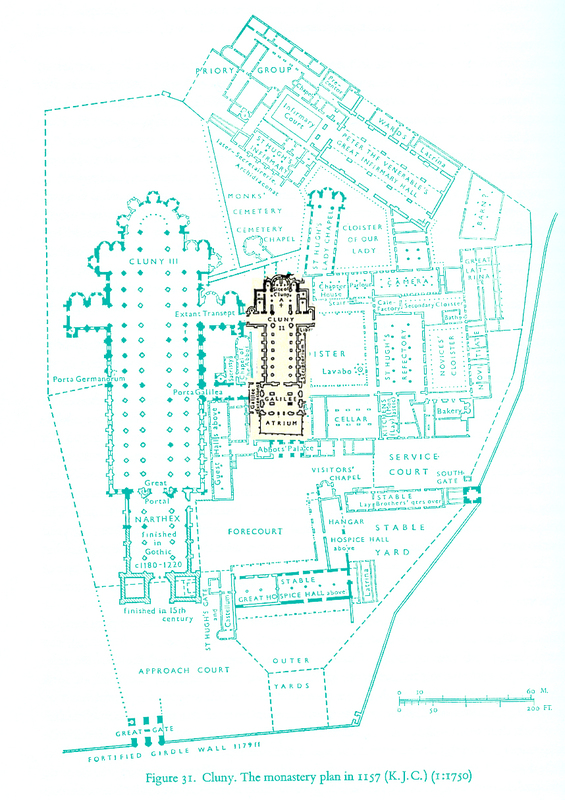 Plan of the church of Cluny II superimposed on the plan of Cluny III. 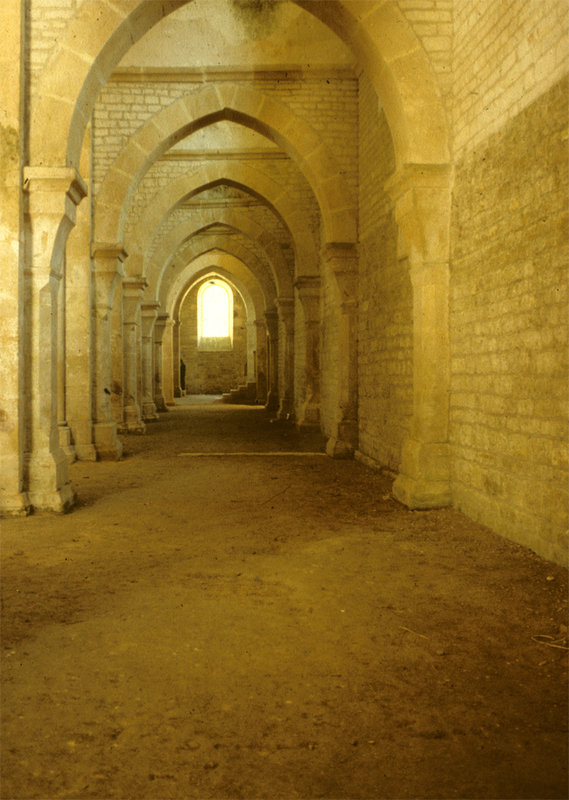 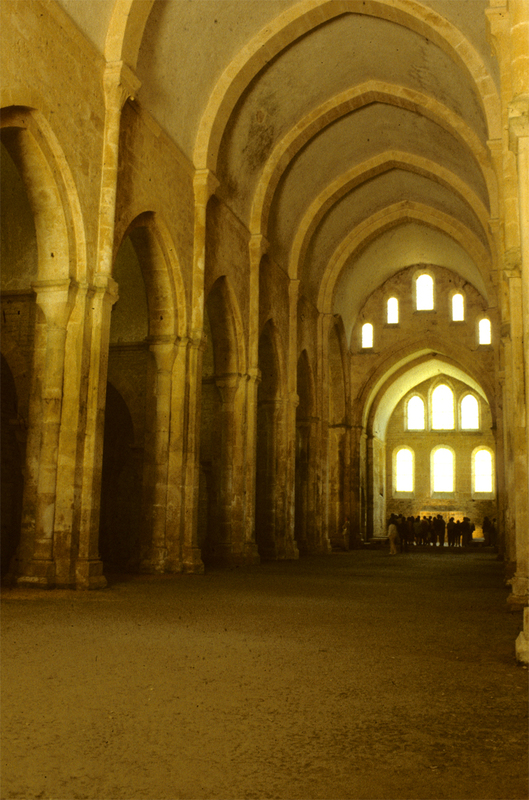 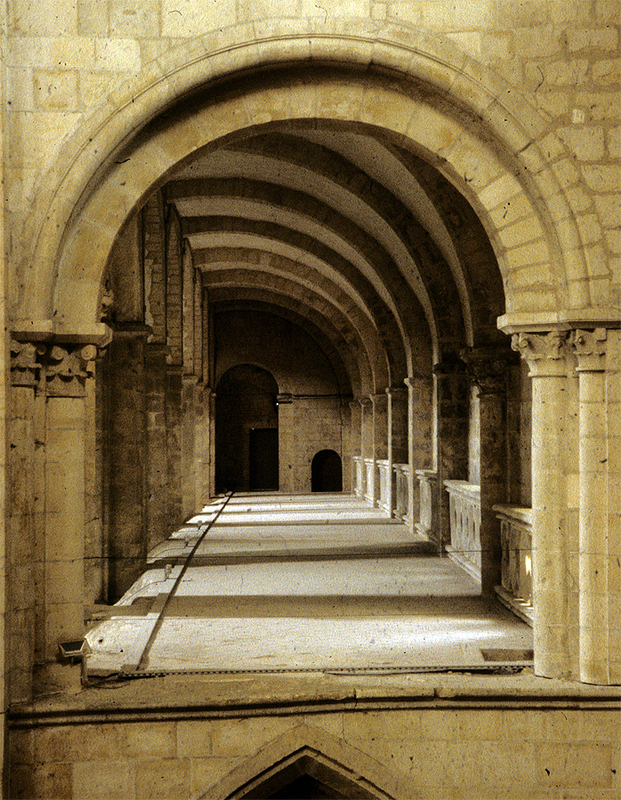 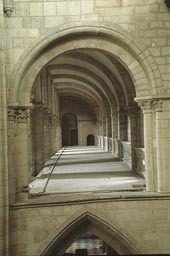 Comparisons: One of the innovations at Cluny III was the introduction of pointed barrel vaults. 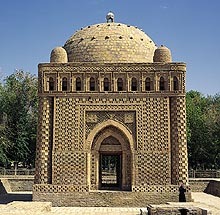 A possible source is Islamic architecture. 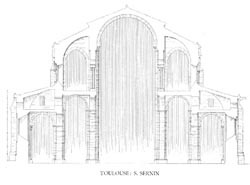 Islamic architecture influenced the architecture of sourthern Italy. 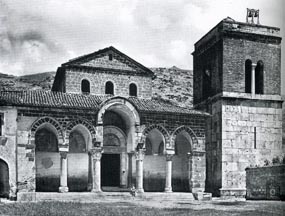 The pointed arch apparently was used in the now lost church of St. Benedict at Montecassino, the mother church of the Benedictine order. 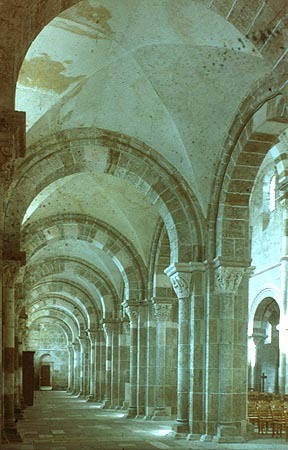 The church of San Angelo in Formis uses pointed arches. 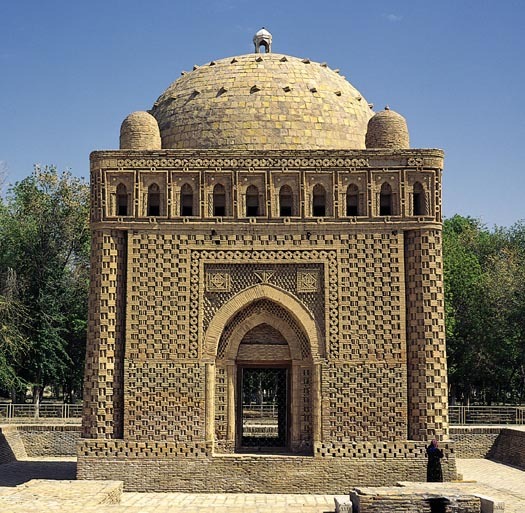 Mausoleum of the Samanids, Bukhara, Uzbekistan, early 10th century. 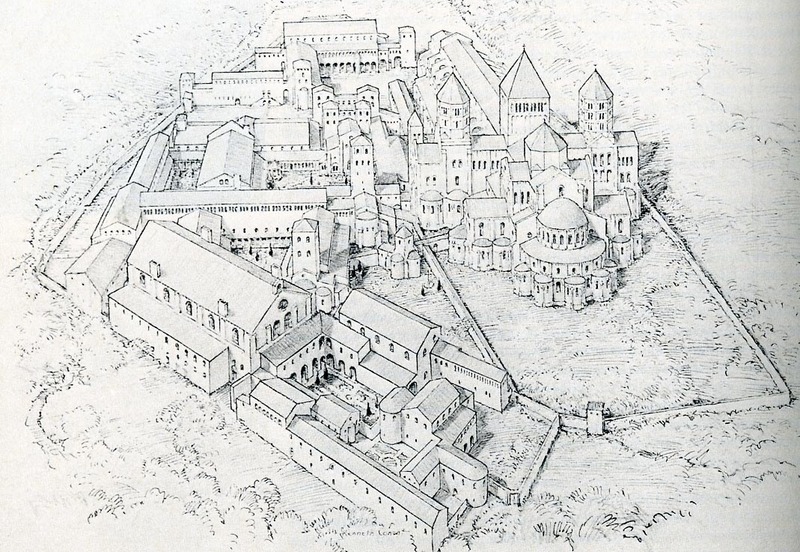 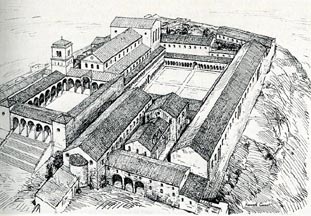 Reconstruction of the monastery of Montecassino. Facade of San Angelo in Formis, Capua, 1058-1075. 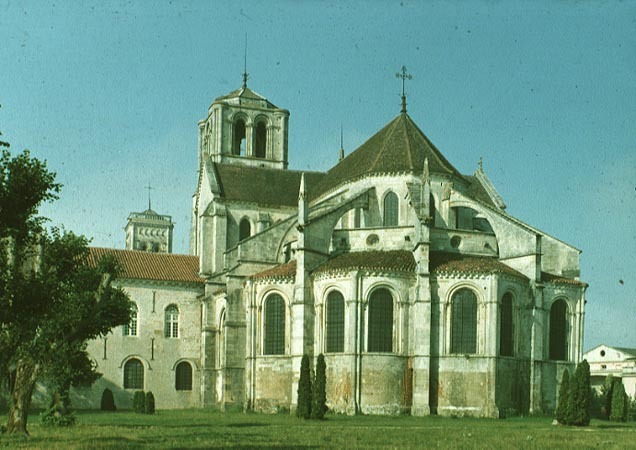 The church was begun by Abbot Desiderius of Montecassino. 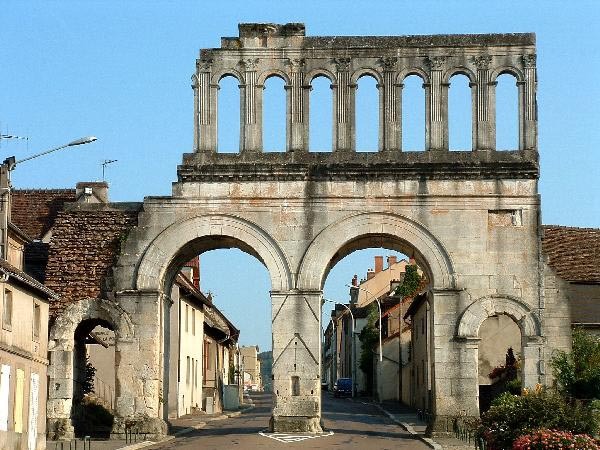 Autun, Porte d'Arroux, Roman city gate, 1st century A.D.. 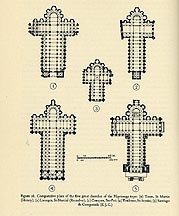 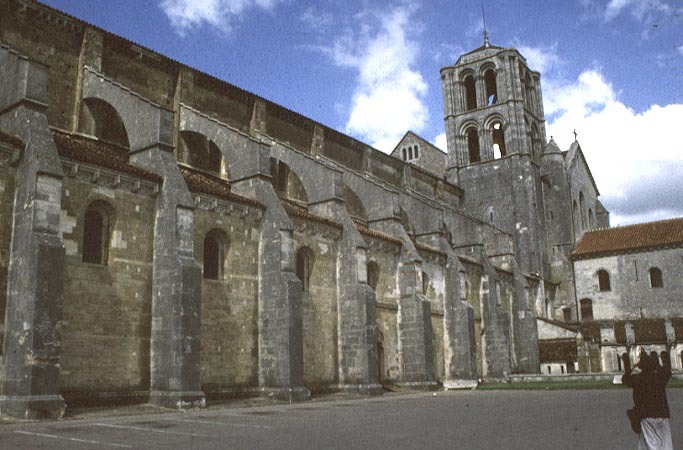 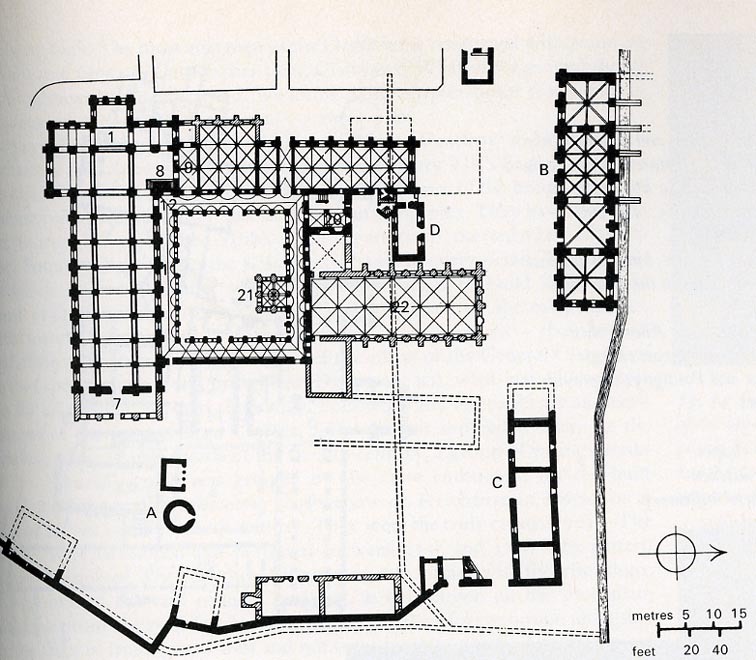 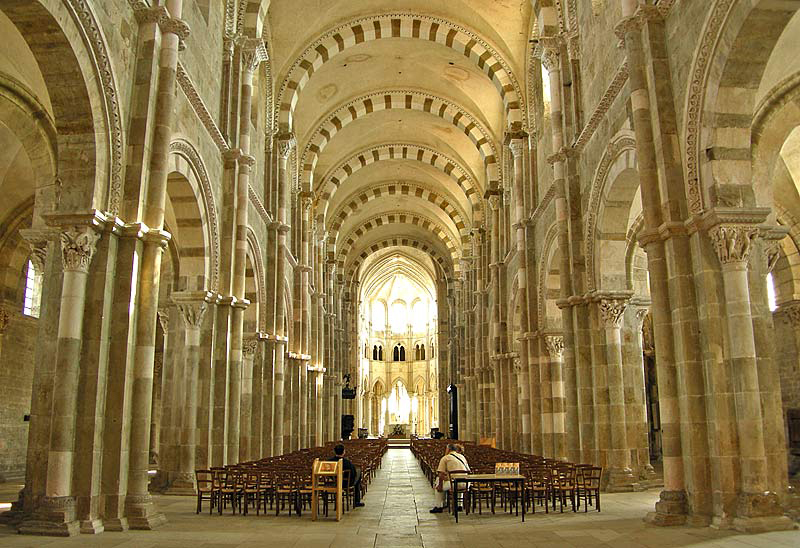 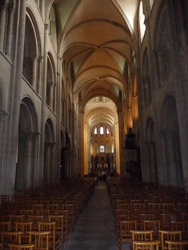 Compare to the treatment of the nave elevations of St. Lazare at Autun and Paray le Monial. 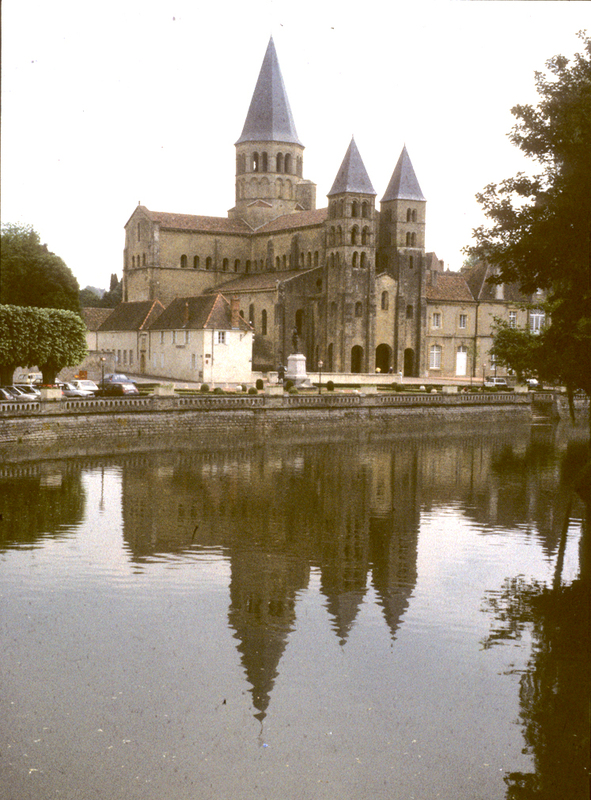 Paray-le-Monial: built between 1080 and 1130. 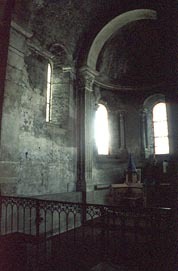 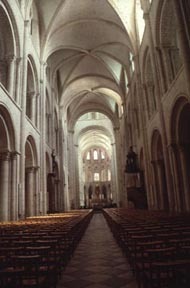 Nave was constructed between 1120s and 1130s. 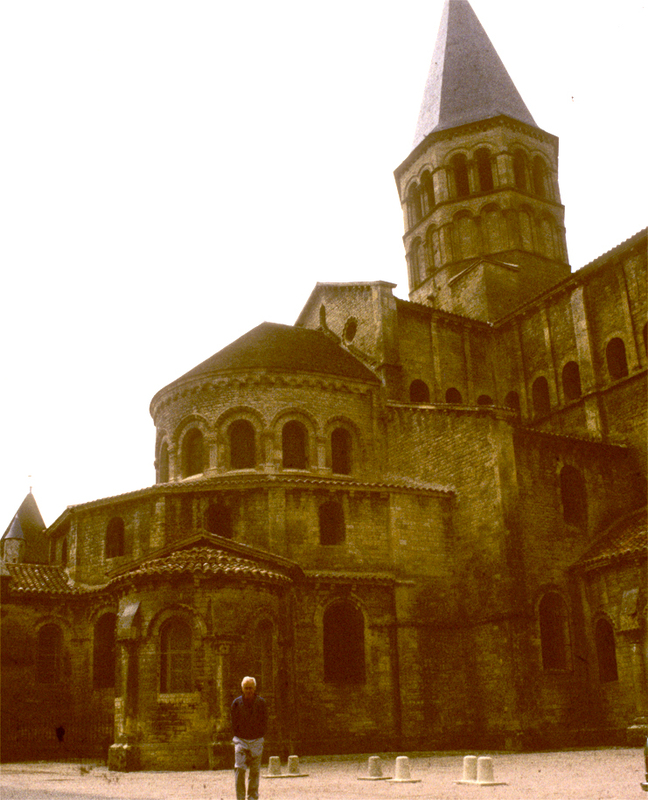 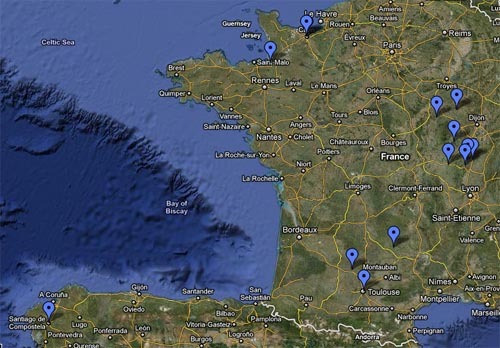 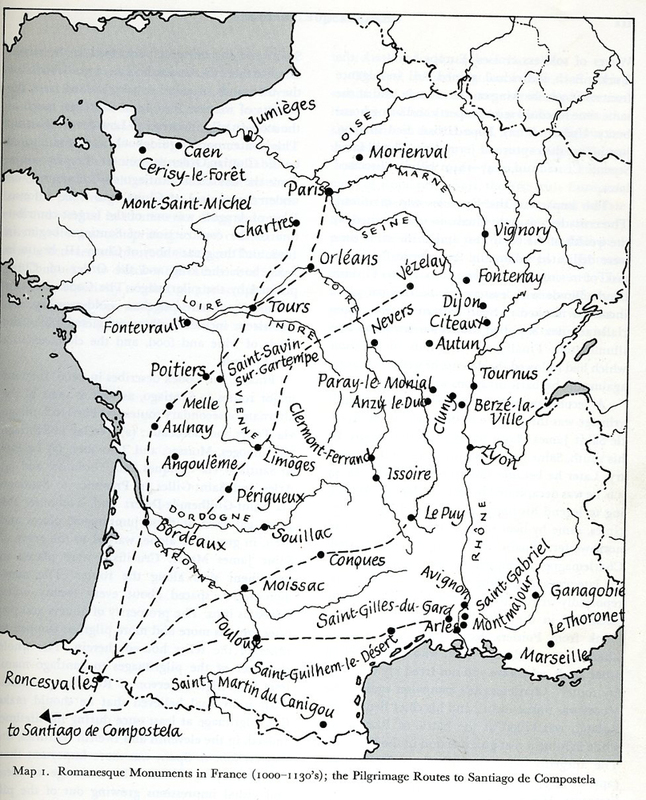 Strongly influenced by Cluny III. 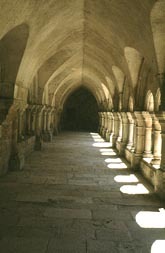 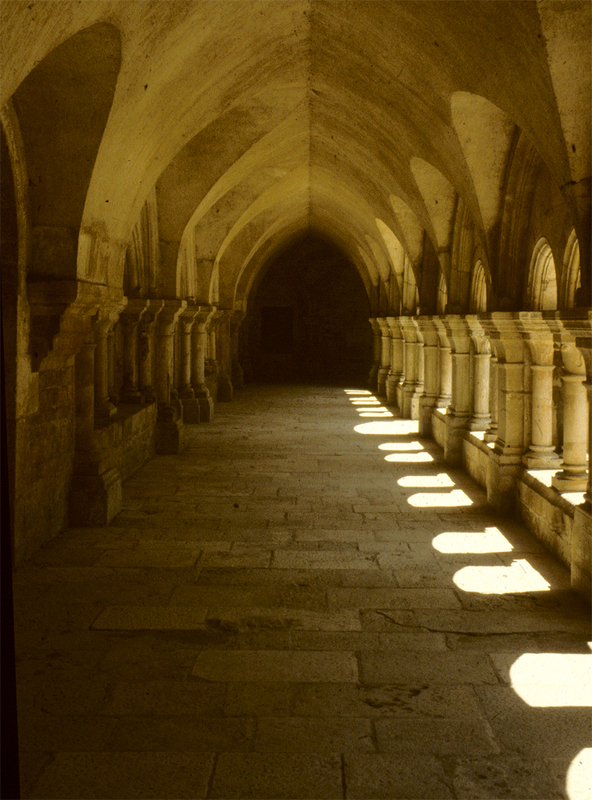 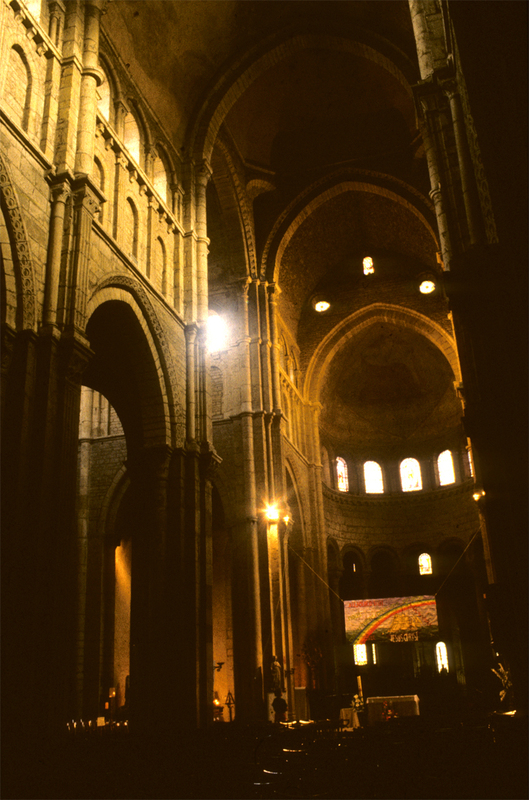 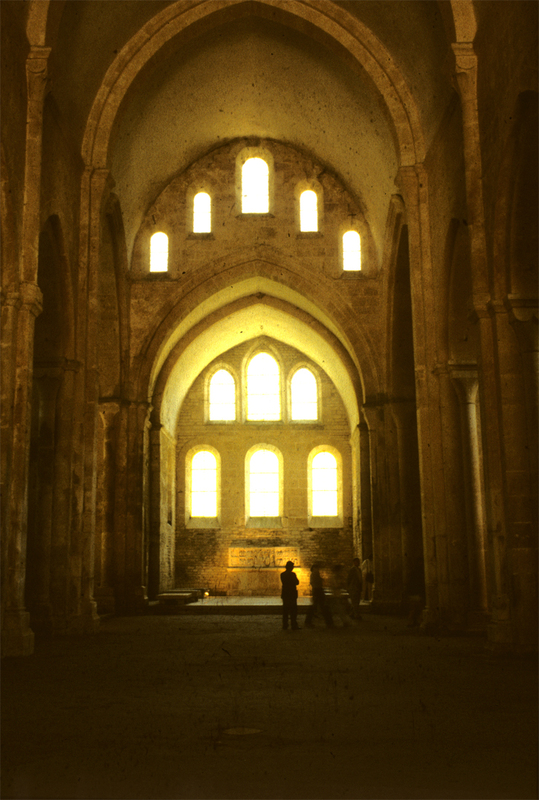 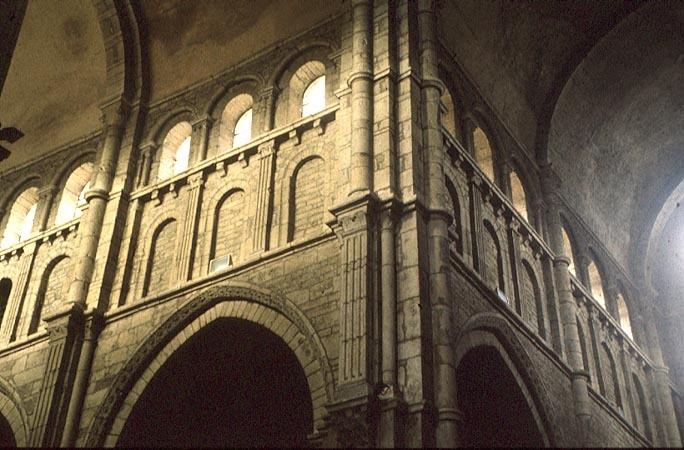 Pointed arches appear in the nave arcade and the nave is roofed with a pointed barrel vault. 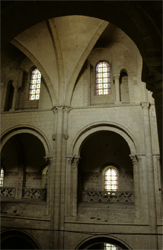 The pointed arches and vault emphasize the verticality of the building. 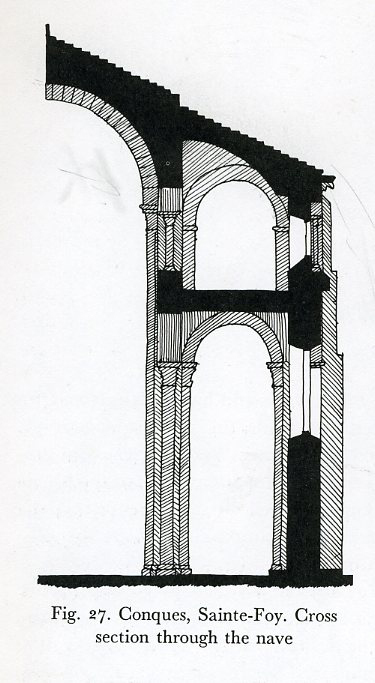 Nave elevation: nave arcade, triforium, and clerestory. 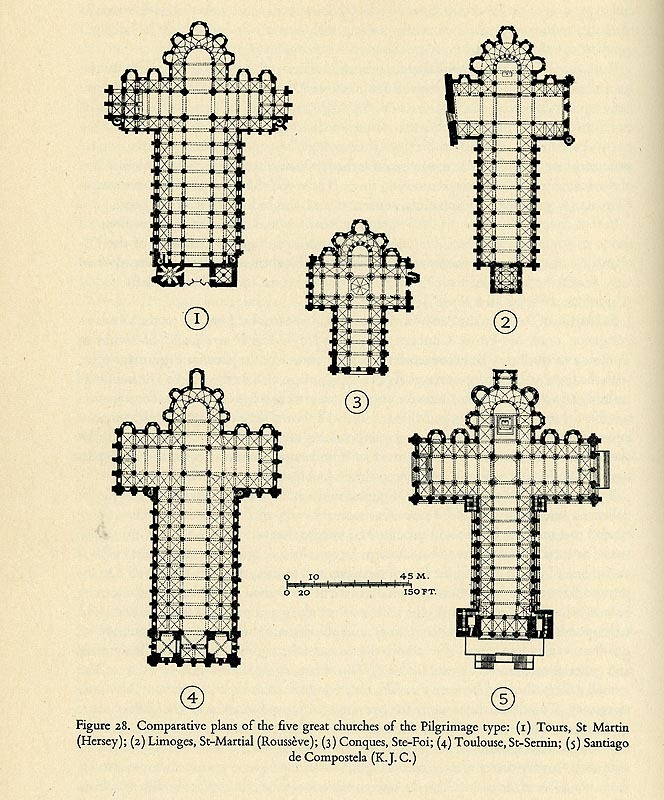 Note the use of pilaster forms to articulate the divisions in the triforium and clerestory. 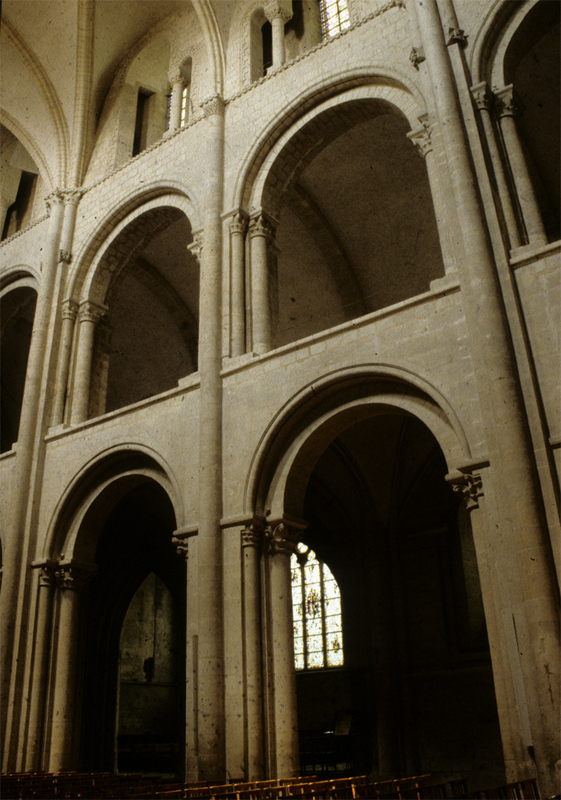 St. Lazare at Autun: built between 1120 and 1146. 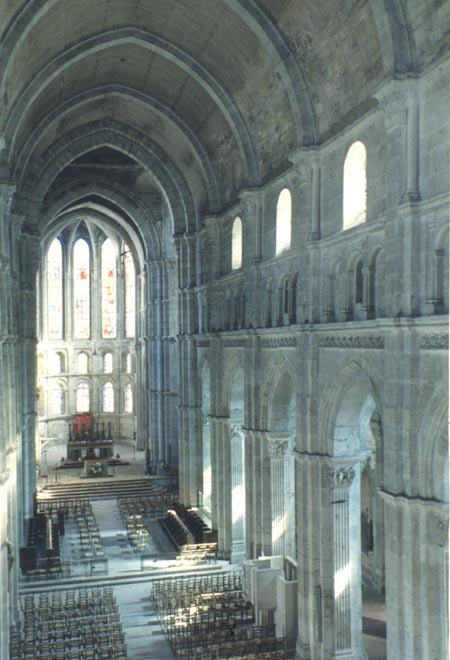 Choir of St. Lazare showing the articulation of the nave wall with classicizing pilasters and arcades. 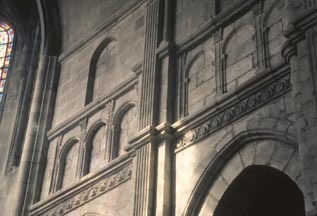 Capitals are variations of Corinthian capitals. 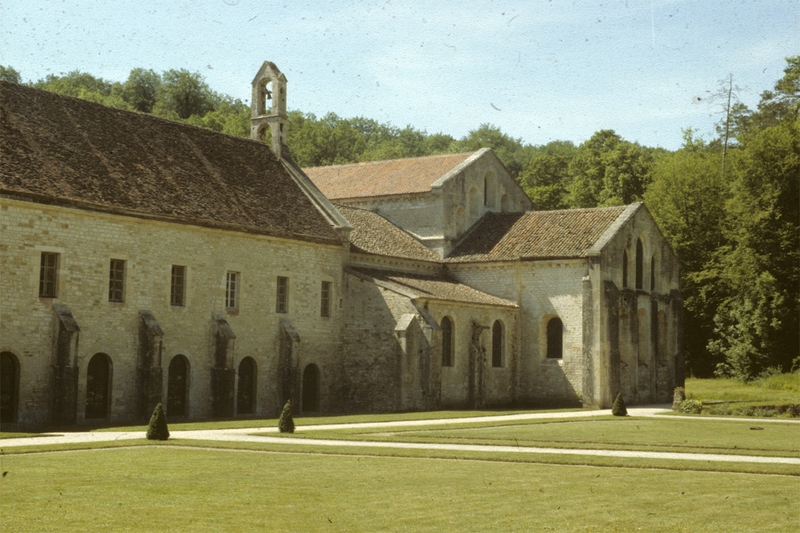 Cistercian Abbey at Fontenay: founded in 1118 by St. Bernard, begun in 1130 by Bishop Everhard of Norwich, and consecrated in 1147. 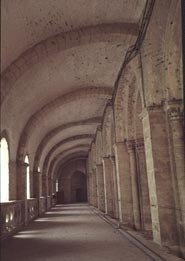 Transverse barrel vaults of side aisle. 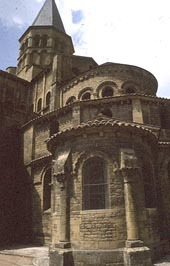 Ste. 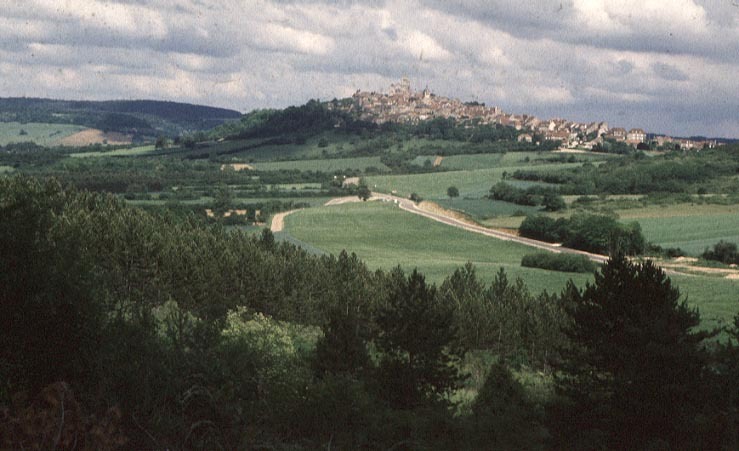 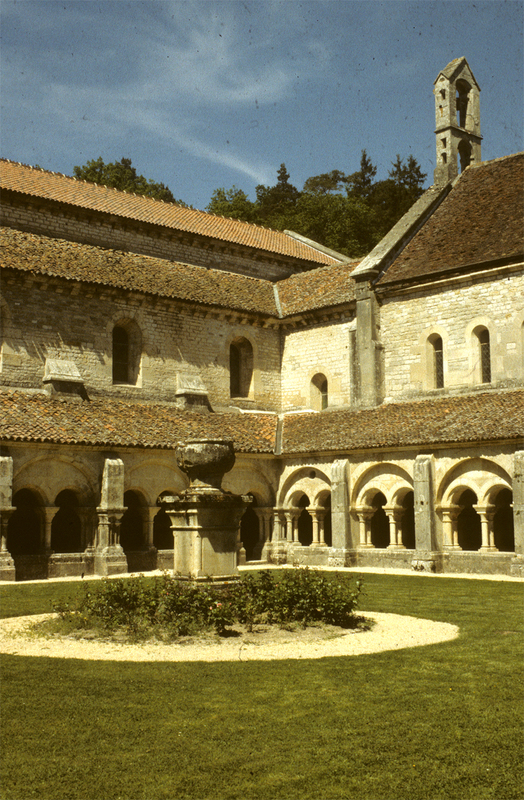 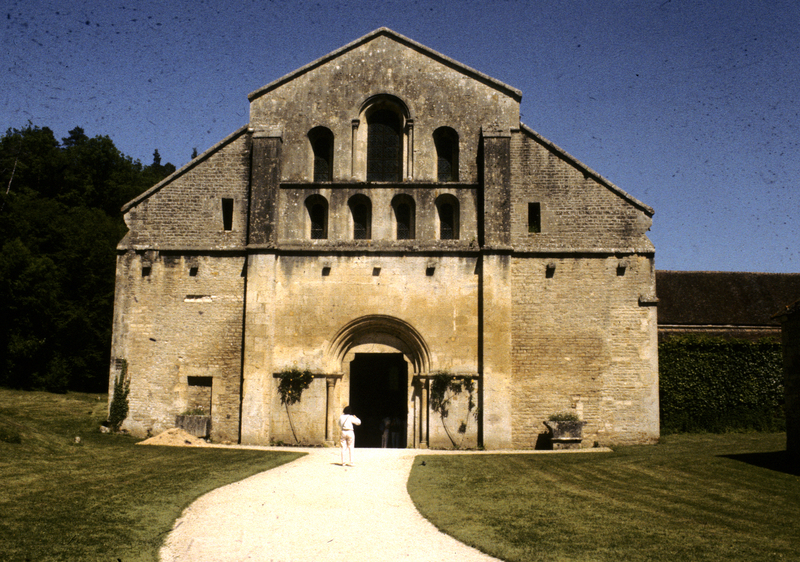 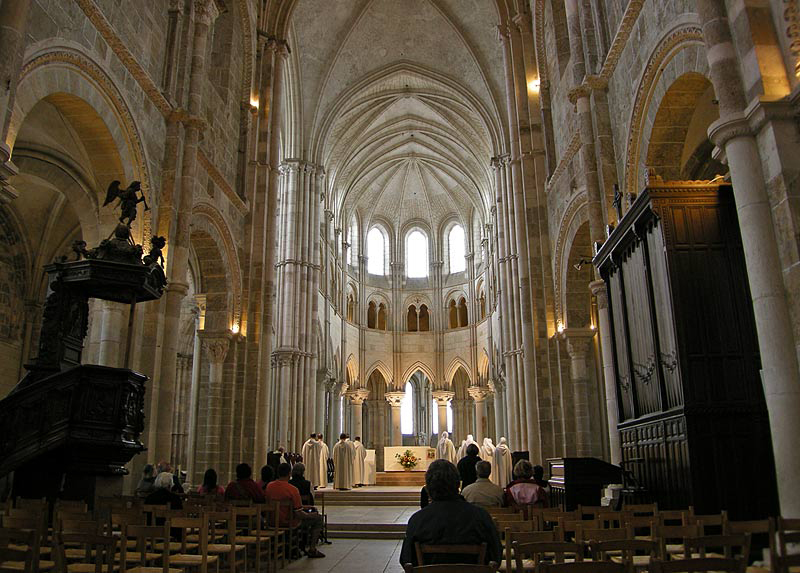 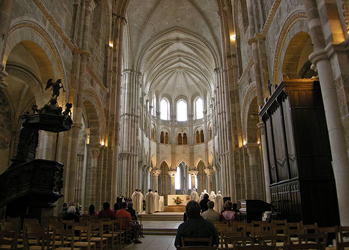 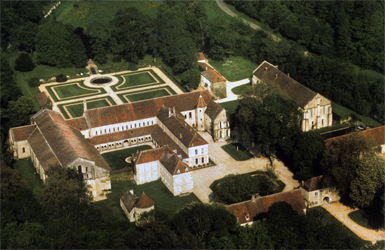 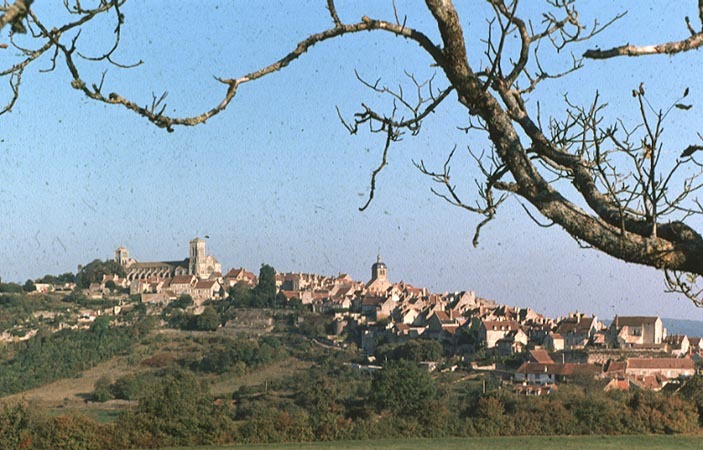 Madeleine Vézelay: This Burgundian monastery was believed to possess the relics of Mary Magdalene. 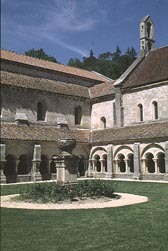 Consquently, this abbey became an important destination for pilgrims. 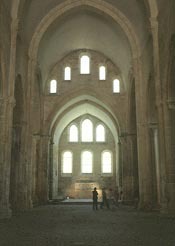 The building was largely built between 1120 and 1132. 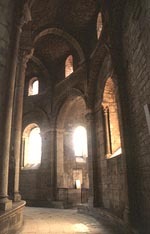 The choir was done in the Early Gothic period, 1185-1190. 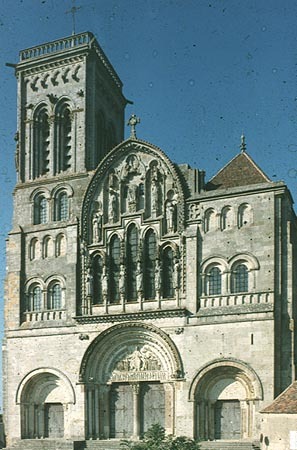 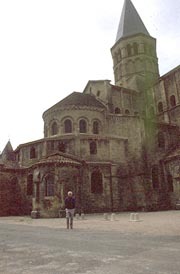 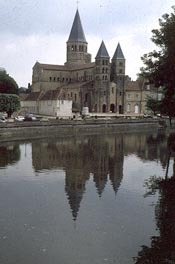 St. Étienne at Caen: or Abbaye aux Hommes, founded by William the Conqueror in 1064 and dedicated in 1077. 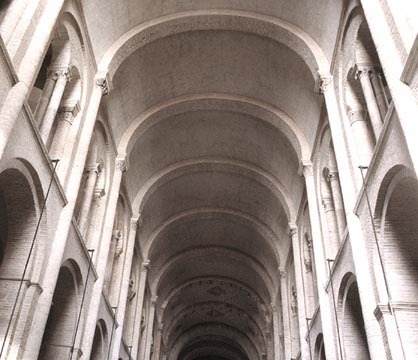 Vaulted about 1130-35. 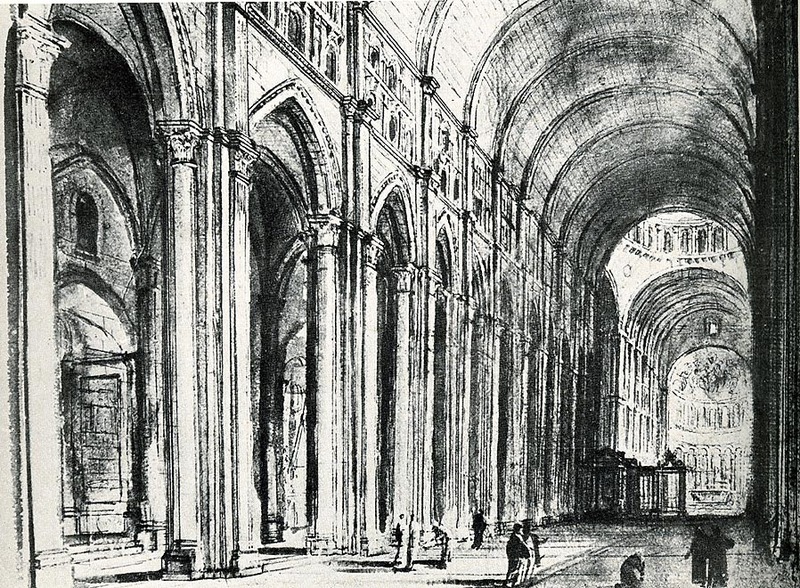 Nave elevation: nave arcade, gallery, and clerestory. 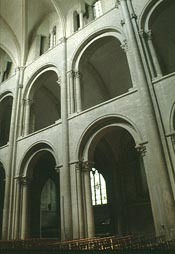 Note the alternation in the compound piers with one composed of pilaster and half column and the other with simply a half column. 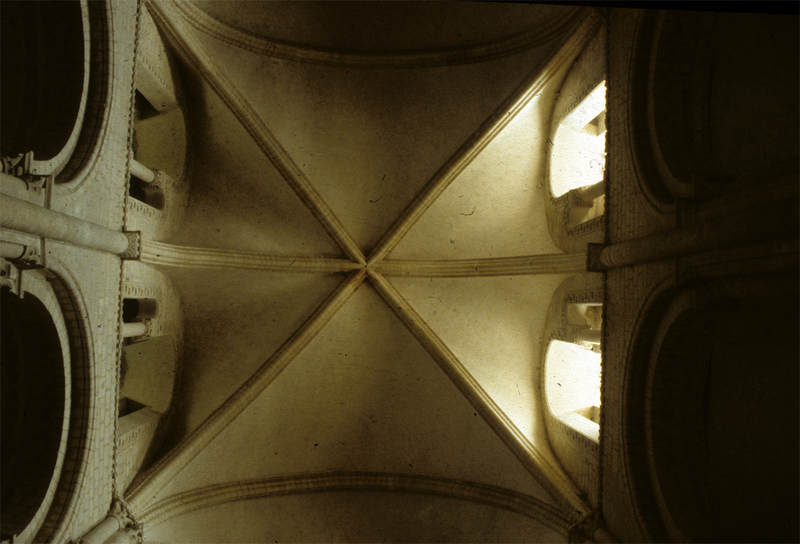 This alternation connects to the sexpartite rib vault above. 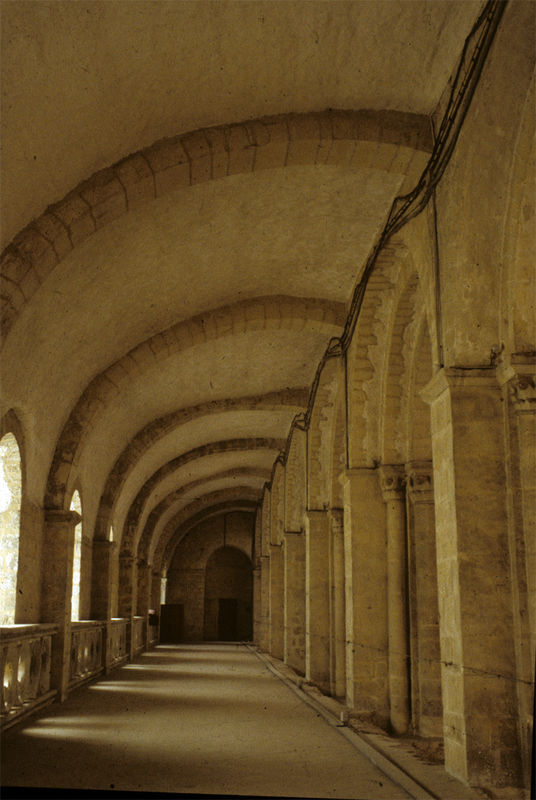 Gallery with half barrel vaults thickened by ribs. 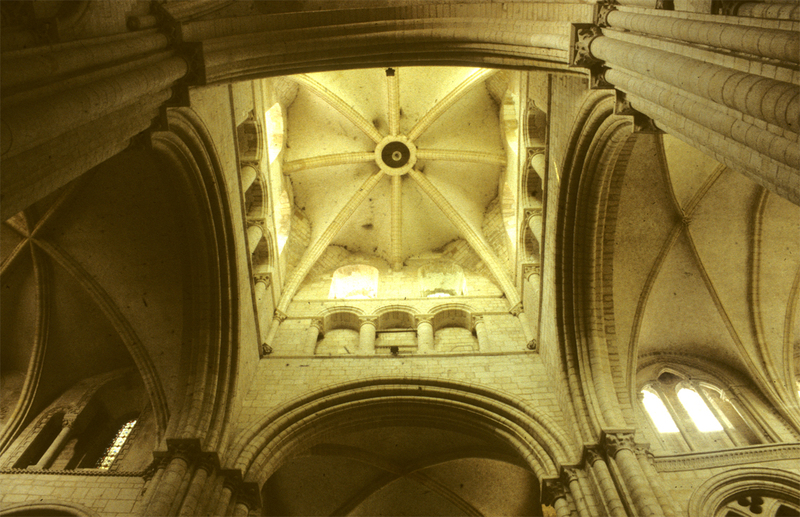 Thrust of nave vault is transmitted through ribs to external wall buttresses.